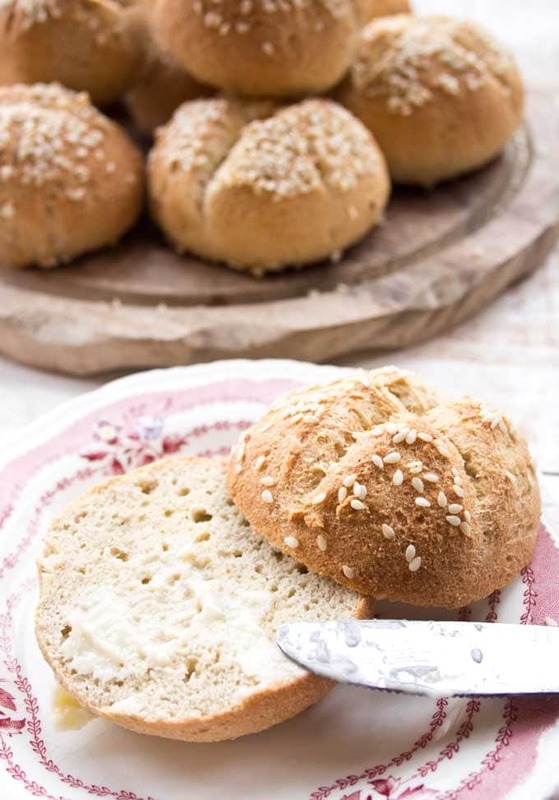 Do you like bread rolls for breakfast, but want to stay low carb? 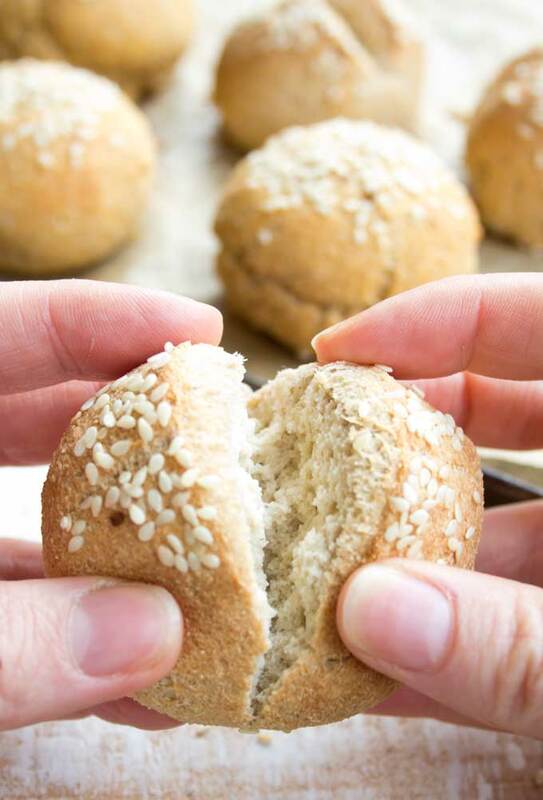 We all loved this recipe for Keto buns, which have a light and airy texture and a gently crunchy crust. They have no eggy taste and keep their shape nicely! One of the things that people often say when I tell them I stay away from wheat and other grains is “No way – I could never give up bread”. The thing is, you don’t have to! Of course, you’ll never be able to mimic the exact texture and crunch of an artisan sourdough. (If I manage to do this one day despite all odds, I’ll be sure to tell you). 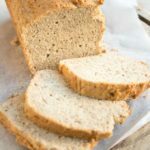 But you can create absolutely delicious low carb and keto bread using grain free flours. Almond flour and coconut flour are by far the most commonly used low carb flours. You can make bread or rolls with either or with a combination of both. I have a popular recipe for almond flour bread on my blog. There’s also a recipe for coconut flour bread which includes flaxseed meal that get lots of positive comments. One of my favourite hacks for making low carb bread is adding psyllium husk. Psyllium is a plant that is mainly cultivated in Northern India. The ground husks are a dietary fibre that is not only beneficial for your bowels, but also works wonders as a food thickener. On top of that, it gives Keto bread a texture similar to whole-wheat bread. Here’s an informative guide to psyllium husk. 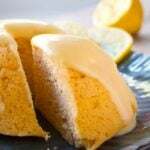 This recipe for Keto buns is based on my low carb rolls. The rolls use both almond and coconut flour – the two work well in combo. They also use butter, which makes them wonderfully rich, almost like a brioche. This time, I wanted to create more of a wheat bread taste. That’s why I replaced the butter with water and ditched most of the egg yolks (the eggy taste is in the yolks). Last but not least, I added psyllium husk powder. Boom! 1.) Mix your dry ingredients. 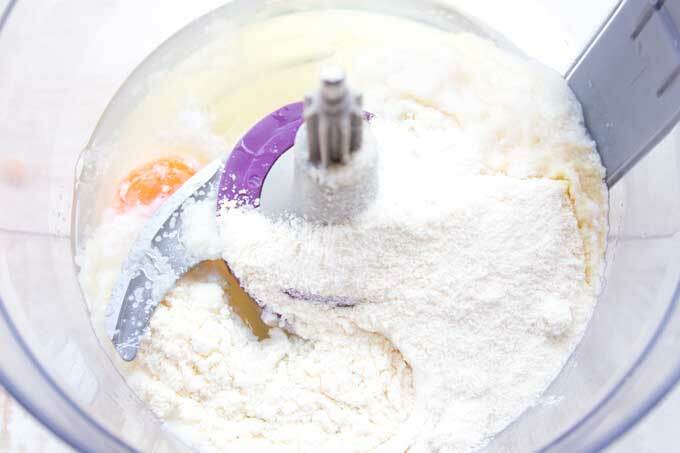 Then put all ingredients in a food processor and blend for about 20 – 30 seconds. Alternatively, use a bowl and an electric mixer. Top Tip: It is REALLY important that your eggs are at room temperature. If you use them straight from the fridge, your buns will rise only very little or not at all. Trust me, this little hack makes all the difference. 2.) After mixing, let the dough sit for a couple of minutes so the coconut flour and the psyllium husk powder can absorb the liquid. This is what the dough should look like. It is soft, but it’s easy to handle and can be shaped with your hands. 3.) To prevent the dough sticking to your hands, wet them. If you want 4 equally sized buns, form one large ball and cut it into quarters. 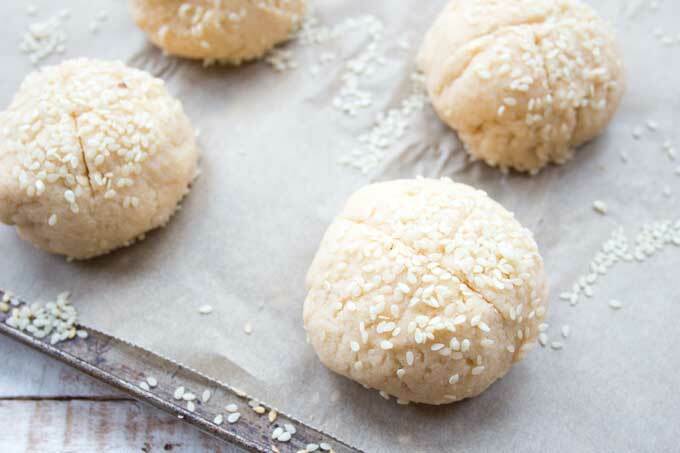 Form your low carb rolls and place them on a baking sheet lined with parchment paper. I sprinkled mine with sesame seeds, but poppy seeds, black sesame seeds or even sunflower seeds would work well too. Make a criss-cross cut on the top if you want the buns to split. 4.) Bake the buns for about 25 minutes in the middle of the oven. And breakfast can commence! Eggs: The most all-important tip is to make sure your eggs are at room temperature. Trust me. I have made this recipe with cold eggs and whilst the rolls still tasted good, they hardly rose. Baking powder: Another reason for bread not rising is out-of-date baking powder. You can test your baking powder by putting some in water. If it fizzes up it’s fresh and you’re good to go. Water: Just boiled is the way to go! Almond flour: I used ground almonds / regular almond flour in this recipe, not super-fine or fat reduced almond flour. If your almond flour is super-fine and you’re finding your dough firm, I suggest to add a little more water. Psyllium: I used psyllium husk powder and not the whole psyllium husks (which look like little sticks). If you want to use whole psyllium husks, you’d have to use 2 tbsp as opposed to just 1 tbsp. All ovens are different, and some can be temperamental. However, I recommend you bake your buns for at least 23 minutes. If you take them out earlier, you might find that the insider is not quite done. For me, 25 minutes gave a perfectly browned crust. If your buns start looking too dark bit the baking time is not yet up, place aluminium foil on the buns to prevent them from burning. You can also rotate the baking sheet so the buns brown more evenly – the back of the oven is always hotter than the front. Note: Many low carb bread recipes use apple cider vinegar to help the bread rise. 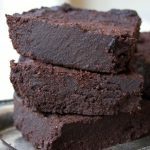 I have tried several of these recipes and have not yet found one that I love. I can always taste the vinegar, which I find off-putting. Using 1 tsp of baking powder gave my Keto buns a good rise and airy texture and they kept their shape. Next time I want to increase this to 1 1/2 tsp to see whether the rolls would be even larger and the air bubbles even bigger. The buns freeze and toast well. I sliced mine in half and toast them straight from the freezer. Not much of a breakfast eater? 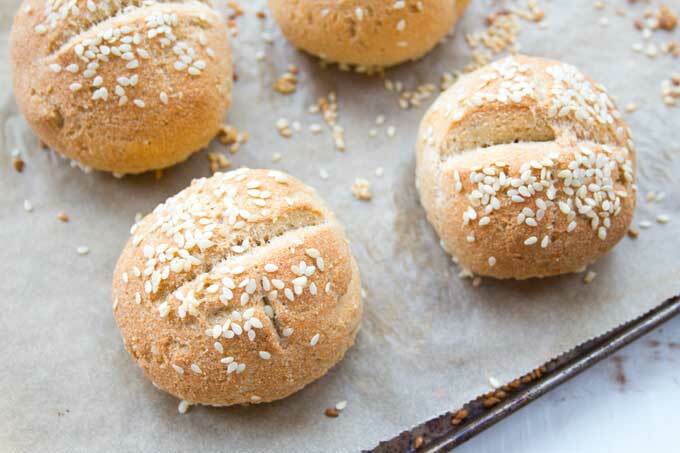 These low carb rolls make a great burger bun too! 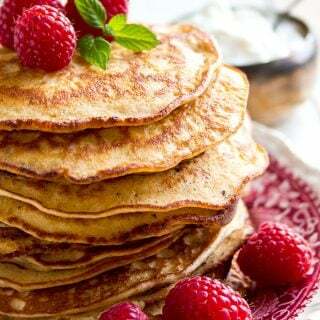 From almond cream cheese pancakes to Keto cinnamon rolls – check out all breakfast recipes on Sugar Free Londoner! 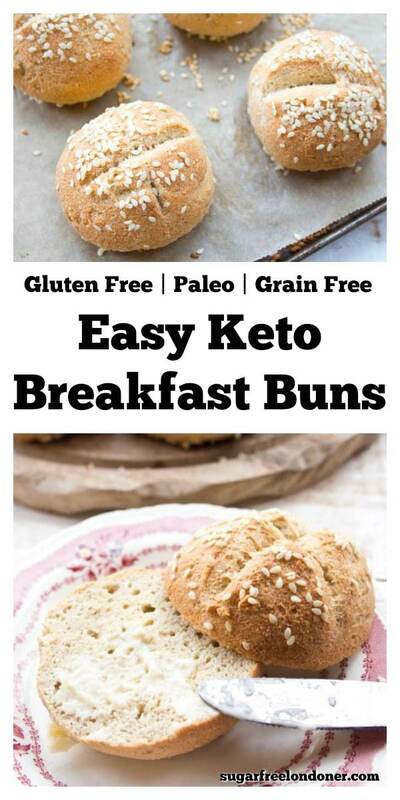 These soft and pillowy Keto buns taste similar to whole wheat bread, but with a fraction of the carbs! 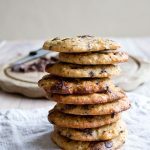 They are easy to make and work with both sweet and savoury toppings. 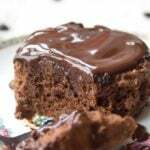 The recipe is gluten free, Paleo and dairy free. Preheat the oven to 180 Celsius / 356 Fahrenheit. Mix your dry ingredients. 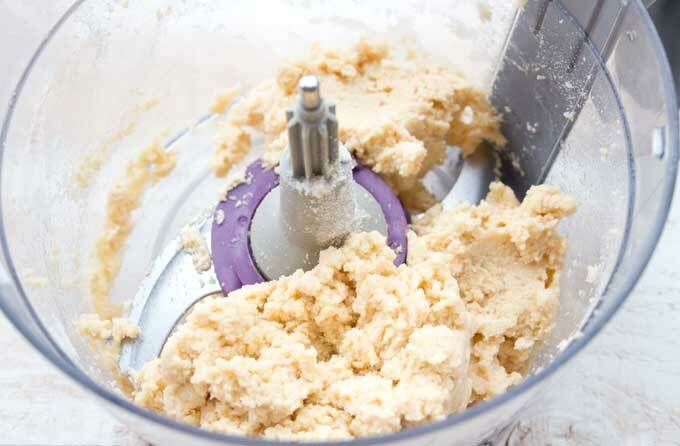 Then put all ingredients into a food processor or mix with an electric blender until smooth, about 20 seconds. Don't over-mix the dough. Let the dough sit for a couple of minutes so the flours can absorb the moisture. Separate the dough into 4 equal portions and form buns. Place the buns on a baking sheet lined with parchment paper. Sprinkle with sesame seeds or seeds of choice. 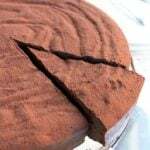 Make a criss-cross cut on the top and bake for around 25 minutes or until browned. Your buns will be lighter and fluffier if your eggs are room temperature. Wet your hands before handling the dough. This way it's less sticky. As with all baked goods containing psyllium, make sure you drink plenty of water throughout the day so you don't get constipated. If the buns are browned before the 25 minutes are up, cover with aluminium foil to prevent them from burning. If you want to double the recipe the oven time may increase (probably by around 5-10 minutes). Hi, Sorry to make a new thread, I cannot reply and add to my last thread. 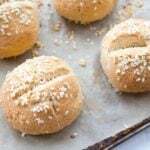 In the notes for this recipe you say Using 1 tsp of baking powder gave my Keto buns a good rise and airy texture and they kept their shape. Next time I want to increase this to 2 tsp to see whether the rolls would be even larger and the air bubbles even bigger.That’w why I originally asked if you ever tried doubling the baking powder. In your reply, you said you use 2 tsp for 2 cups of almond flour which isn’t even the amount of flour to baking powder ratio in this recipe so I am confused. I don’t want to waste time/ingredients. Can you clarify please? Hi Jennifer, sorry about the confusion! There was a spelling mistake in my answer – I meant to say I WOULD use 2 tsp baking powder if I doubled the recipe. I did say in the post that I wanted to experiment with more baking powder. But in hindsight, 2 tsp for the recipe might just be a little too much. THat’s why I said in my first answer to you that you may be able to taste it. I have revised the amount in the post to 1 1/2. That should give more rise without a baking powder taste. You know, 2 tsp MIGHT be fine, but I don’t want anyone to make the recipe and it’s a disappointment. To answer your question, I have not tried it yet with any other amount than 1 tsp baking powder. If I do, I’ll definitely change the recommendation in the post. Hope this helps! These look so lovely, I’m thinking about making them for Easter. However they look pretty large and I’d prefer a small dinner roll. If I make 6 smaller rolls, would they need a shorter baking time? Thank you! Yes, that’s a good point. They’d probably need a little less oven time. But you still want them to be browned on top, so it might only be a few minutes less. Hi did you every try double the baking powder? Hi, you could always give it a try, but you may be able to taste it. 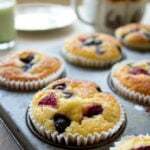 I use 2 tsp of baking powder for 2 cups / 200g of almond flour. The dough came out really liquidy. Any idea what happened? Hi Andrea, I’ll try to help, but I can only guess. It’s important to use either scales or US measuring cups to make sure you’re getting the right amount of ingredients – and use all the ingredients stated, without substitutions. If you have done that, the only other thing I can imagine that you might have used extra large eggs, which could have resulted in dough more liquid than mine. You can check in the step by step images how the dough should look like. I hope this helps! That’s so good to hear!! Love it! Is a keeper. I just had to come back and say that I *heart* these rolls! They made the best ham and cheese sandwich, toast, and toasted ham and cheese. I haven’t tried your other breads yet, but this is the first time I’ve eaten a low-carb bread that reminds me of regular bread. I’m so happy to be able to have sandwiches again! Thank you! 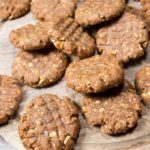 Would I be able to use just almond flour? I’m allergic to coconut. Thank you. 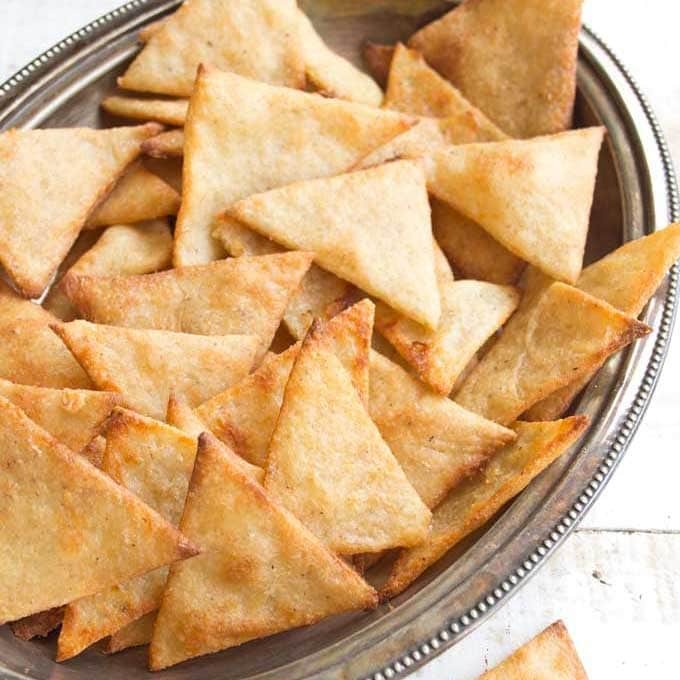 You’d have to increase the amount of almond flour because it’s less absorbent than coconut flour. In place of the 1/4 cup of coconut flour I’d use 1/2 cup of almond flour, so the total almond flour amount would be 3/4 cup. If your almond flour is quite coarse, you may need to add another 2 tbsp on top of that. Let me know how you get on! 3rd trial to make keto friendly bread. So trying your recipe. I was wondering what size of egg you use. I am summing from a regular to an x-largebegg it would make a difference in the texture. I get my eggs from a farm, so they are mixed. I tend to use the larger ones out of the pack for my recipes. But they are definitely not x-large. These came out really well! I am wondering about doubling or tripling the recipe to make a loaf. Have you tried that? I like that this is a lighter and lower calorie recipe than some other low carb breads. Hi Joanna, I have not tried this yet, but it’s a great idea. I don’t see why it wouldn’t work. 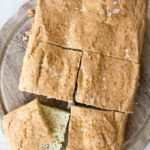 I’d try doubling the recipe, putting it in a small bread pan (I bought a half-size pan for my low carb bread – check it out) and DEFINITELY increasing the baking time. Maybe 10 minutes more, maybe even longer. You’d have to keep an eye on it, insert a knife to see how the inside is doing. If I get around to it before you, I’ll put it in the post. Let me know if you try it before me! The color is way off for me. They’re a bit purple on the inside rather than these which look like normal bread buns. How can I fix it ?! Hello, I have heard that some psyllium brands end up turning purple, which does not affect the taste though. I have used the bonpom and the green origins brand without discolouration problems. I have heard from other food bloggers that the Now brand (available in the US) is also fine. Hi my buns dud not rise very well they look more like buscuit what did i do wrong ? Hi Lars, if the texture of your dough was soft, but easy to handle (which it should be if you weighed your ingredients), the reasons could be 1) out of date baking powder 2) eggs were not room temperature 3) you compacted the dough too much. I really want you to get it right next time, so I”m just listing the things here that could go wrong. What you could also do next time is add a little more baking powder (check it’s fresh) to see if you get more of a rise – 1 1/2 to 2 tsp i total. One more thing you could try is beat your eggs until they are really fluffy and then mix in the rest of the ingredients. I hope this helps! THese came out looking so good!!!! They are still warm and I’m eating one with butter and homemade sugar free blueberry jam. Yum!! SO glad you like them Mary! Could you please clarify the number of servings? Above the recipe it says 8 servings. But in the instructions the dough is divided in 4 pieces. Is one serving half a roll? Thanks! Thank you! They look so good.